TSO Parallel Guide System - TSO Products LLC. Set aside your understanding of Parallel Guides and imagine what is possible with a systems approach. TSO designed the TPG is to be part of a larger “System” - more than one “product”. The start of the TSO System is the trusted GRS-16 Guide Rail Square. 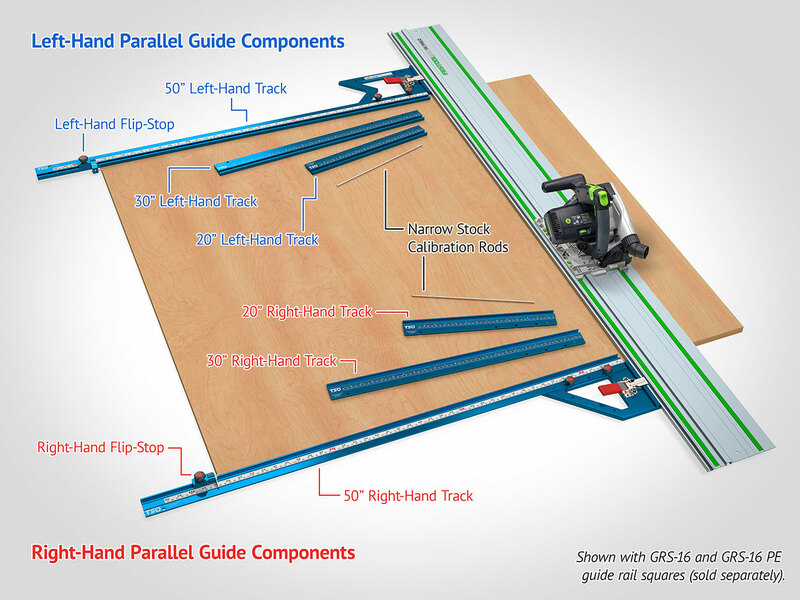 Once the GRS-16 was in production, it begged the question “ why not make (parallel) rip cuts in one step together with the squaring cut?” – really, - Why Not? A pair of M6 accessory mounting holes were added 100mm on center. The same accessory mounting hole spacing is repeated on TSO’s very capable MTR-18 Multifunction Triangle with both sharing multiple interchangeable accessories. The foundation for System compatibility had been formed. But the TPG was still in the concept stage. A key TPG design principle stems from the recognition that breaking down functional parts down into smaller units just for the sake of storage and convenience cannot improve accuracy or speed of use and convenience. A principle abundantly proven with the GRS-16 machined of one single piece. Tool-less set-up and take-down would be another design cornerstone. To begin - the TPG System can perform every operation of every other well known parallel guide. Only the TPG System combines squaring and ripping into one operations with one single T-track– DONE ! The ultimate simplicity and convenience exclusively made possible by the GRS-16 Series Interface (Patent Pending). Only the TPG System quickly and tool-less disengages from the guide rail for easy handling or storage while speeding re-assembly without loss of calibration. Only the TPG System permits a quick and calibrated repeat length cross cut on the MFT/3 when paired with a GRS-16 PE and 1080 rail connected to the MFT hinge bracket – no more squaring adjustments between MFT take-down and renewed set-up. Only the TPG System eliminated a very long list of limitations listed by users of the other parallel guides - refer to our list of Design Goals Statement below. The two key TPG System Elements are designated TPG-30 R and TPG-30 L. They are designed to work with and attach to GRS-16 and GRS-16 PE Guide Rail Squares using the included Multi-lobe Knobs. Refer to the picture showing both RIGHT Hand and LEFT Hand TPG’s used with GRS-16’s on a guide rail. The numbers following TPG- refer to the nominal cut-length achievable with a particular T-track – NOT the length of the T-track extrusions to which are added the section of GRS-16 between the T-track and the guide rail. Once in full production, the System can be purchased and used as individual LEFT-Hand and RIGHT-Hand System Sets. Early GRS-16 Series Upgrade of accessory attachment provision (2 tapped M6 Holes). Q.: what does the TSO TPG Parallel Guide product line consist of? Q.: Do I need to have two GRS-16 Guide Rail Squares to use the TPG-50 or elements of it? A.: “Depends” – if you a regularly making repeated 8ft long cuts you will want to use two GRS-16 / GRS-16 PE Squares. Cuts narrower than the guide rail width also require two GRS-16 /GRS-16 PE. For the most common shorter parallel cut lengths a single GRS-16 with a single TPG-30 Right Hand will get the job done. Think of typical base- and wall cabinet dimensions. The 20” T-track will benefit you with its compact size. A.: we plan to introduce two storage options: A storage/carry bag with multiple pockets and for the shorter 20” T-Tracks KAIZEN Foam pads contour cut to fill a SYSTAINER for customizing by the customer in the field. This can store the 20” T-tracks with FlipStop in a SYSTAINER next to a GRS-16 / GRS-16 PE. Look for our KAIZEN Foam blank SYSTAINER pads and hand tools for pocket cutting on our website in March 2019. Q.: What do the other TPG models designate and why? A.: TPG is available not only as a complete set including all the component variations but the components are also available for purchase as individual sets. Why? – to give purchasers the choice to buy what they need when they don’t need everything all at once – or when they need additional components to create dedicated sets in their shop or job site. Q.: How long will Introductory pricing be offered? A.: Introductory Pricing will extend for 30 days from beginning of shipments of the full TPG product line. Q.: how can I get answers to other questions? A.: email your question of general interest to info@tsoproducts.com. If the topic is of wider interest, we will provide an Answer on this FAQ. We are not staffed to carry on correspondence of a general nature with prompt responses. That is why we provide this FAQ and update it as needed. Add info@tsoprooducts.com to your address book to help ensure our mail is not automatically stopped at a firewall somewhere.